The Australian Women and Leadership Forum ‘Darwin Leadership Voice’ attracted a strong contingent of women from Charles Darwin University at the one-day event in Darwin on Thursday, 24 August. Organised by Workplace Training Advisory Australia, CDU was the gold sponsor for the event which attracted 85 women from the Territory. The women came from government, education and business organisations. During the past 18 months, 20,000 successful women from across Australia have taken part in the forum which is designed to help women develop their leadership skills and to support local business networks. One of the keynote addresses at the Darwin event was given by Professor Alison Elliott, CDU’s Head of the School of Education, who gave an amusing and inspiring talk on juggling career and family life. The program included exploring the key attributes of leadership, emotional intelligence, self-evaluation, and communication styles. 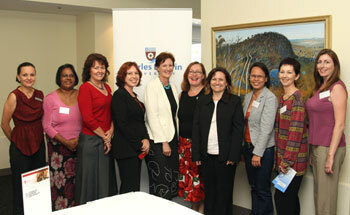 Photo: At the Australian Women and Leadership Forum in Darwin (from left) Aretha Amos, staff professional development consultant PMD, Veronica McClintic, lecturer Indigenous Academic Support Unit, Barbara Cotton, coordinator access services Library, Marie-Claire Cull, marketing manager Corporate Communications, Professor Alison Elliott, Head of the School of Education, Christina Spargo, organisational development consultant PMD, Natalie Peters, records manager ITMS, Maysie Procianos, international admissions officer International Office, Robyn McDougall, public relations manager Corporate Communications, and Tanya Shields, short course coordinator BusinessLink. Other CDU women attending the course, but not pictured, are Karen McKeon, exams supervisor Health in Alice Springs, Melissa Newbigging administrative assistance LBA, and Penny Shirras, market analyst Corporate Communications.